Spring Fever has officially set in. We have yet to see a day above 55 but I can’t wait any longer to start grilling and cooking some lighter, Spring inspired dishes. 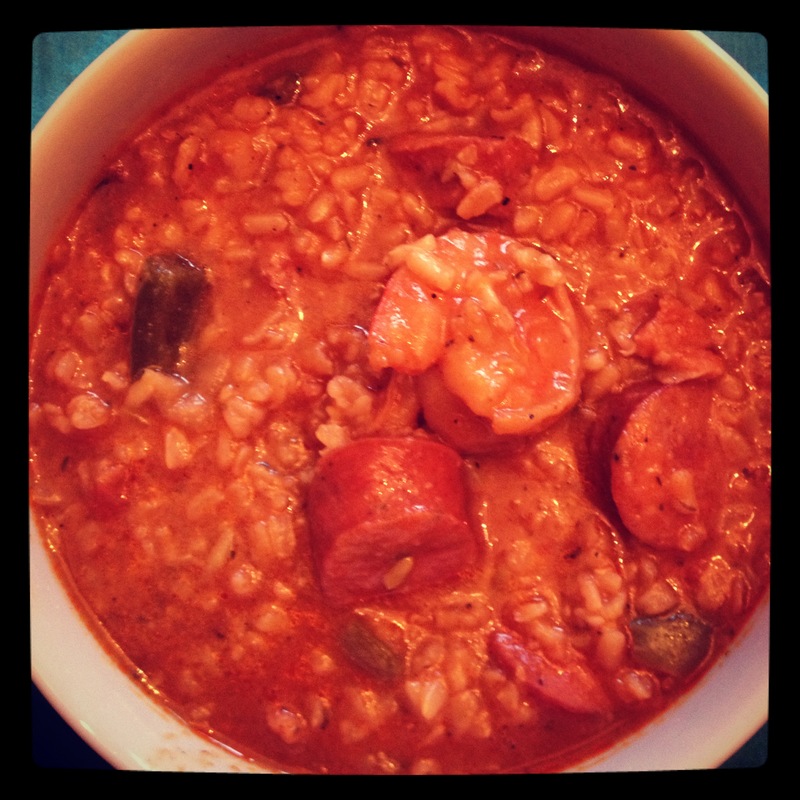 The week started with a Jambalaya. I was looking for something with a little heat and outside of my comfort zone. I have never made jambalaya before, so I turned to Emeril for some inspiration. This is definitely something we will make again. It made 6 generous servings and was delicious. I thought it was even better the second day! If you like your food really spicy, add more of the Creole seasoning. If not, you can always add less. 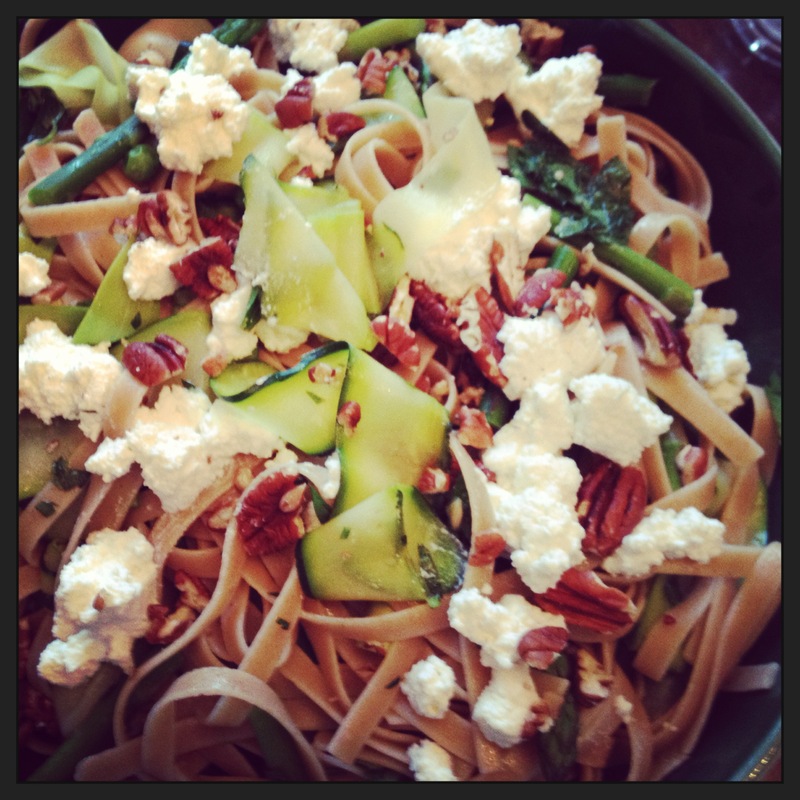 I found a recipe on Pinterest for a zucchini and fettuccine pasta dish. Rather than stop there, I decided to add asparagus and peas. I will say that the original recipe had too much lemon and too much parsley for my taste. I modified it and liked it much better. If you really like lemon and parsley, add the juice of a whole lemon, and 1/4 cup chopped parsley. For this recipe, make sure you read the whole thing. You end up adding the veggies to the pasta to save time and dishes! This was just what I had in mind for a Spring inspired meal. Today (Thursday) is the nicest day of the week so far. I decided enough was enough and we could finally dust off the grill. Grilled sirloin was on sale, so that is what I bought. You could really use any cut of steak though. Greg is slightly obsessed with Chimichurri sauce, so I decided to make some to go along with our grilled sirloin. It is so easy to make and really punches up the flavor of a steak. Oh, and remember how the pasta dish only called for half of a bunch of asparagus? That is because grilled asparagus is a great side for steak! Drizzle it with a little olive oil, season with salt and pepper, and grill it for a few minutes on each side. This week I tried to utilize any leftover ingredients you may have had from earlier recipes, for the Quick Fix recipes. Hence the asparagus and ricotta pizza, and the steak quesadillas. I can tell you right now that I will be making the pizza and cannot wait to try it! I hope everyone can enjoy some time outside this weekend!